Since the age of 8 (and I’m now 43) I have been a big fan of the Austrian alps, it’s such a beautiful part of the world! I love winter sports, from watching the downhill ski-ing and snowboard slopestyle on TV to freeriding the slopes on what is now an almost antique Ride snowboard. 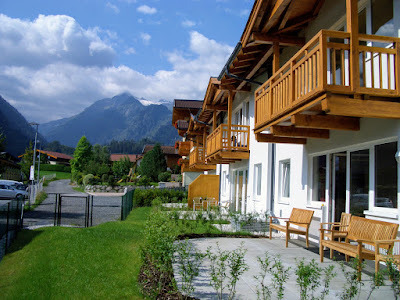 It never really occurred to me that it was a summer holiday destination until 2003 when we made our first wonderful trip to a village near Innsbruck after we had seen a feature on the BBC’s Holiday programme. A few years later and we decided to return to Austria with two small children and little did we know that we would unearth a real gem of a place that would capture all of our hearts and minds. And so it is that we have made our 5th (yes 5th!) summer excursion in seven years to Sue & Derek’s fantastic austria holiday apartment in Kaprun. Why change a winning formula! It is still an exciting place to visit where we can enjoy what we have experienced previously coupled with the fascination of discovering new and interesting places and events. This is of course made a little easier as our children get older – they were just 4 & 6 on our first visit and are now 10 & 12 but they love going back just as much as we do. The start of this years trip wasn’t the best when we couldn’t even get off the ground in England, our flight was cancelled as we were sat on the plane (curtailed by a lightning strike!). But we knew what we were going to miss so hastily re-arranged a new flight to get us on our way. On arrival at the apartment the stress of that major problem quickly evaporated and was very soon forgotten. The apartment was clean, comfortable and in great condition just as it has been in past years and so didn’t disappoint. We had a nice relaxing evening watching a film, having a bite to eat and deciding what we should do the next day. Well the heat wave seemed to have settled in and at 30c it was a simple choice of which lake or pool (or both) to go for a swim in. As we like the ambiance of Zell am See we chose the lido or Strandbad. A family day pass was around €23 and as we arrived early when it was quiet we did get our money’s worth. Great fun to begin the holiday and fantastic views around the lake. Without much persuasion my youngest daughter & I took an exhilarating tow behind a speedboat from Edi’s Wasserskischule, “Daddy I’m hanging on for dear life” she said quite calmly really, which is pretty much what I was doing too! Very proud I was though. There are other activities on offer such as water-ski-ing, wake-boarding, the donuts and banana boat so something to keep those with an adrenalin rush entertained. It was also Wednesday which meant that the weekly summer festival – the Zellersommernachtsfest – was on too. We ate outside in one of the many restaurants and then enjoyed street festivities particularly the music – a mixture of traditional Austrian oompah and the more contemporary – and the food & drink on offer at the many stalls. The atmosphere made it so that we visited it again the following week. We had such great weather, it was wonderfully sunny and incredibly hot with the forecast for it to continue so our two favourite ways of cooling down are to go up into the mountains in the morning and then go swimming in the afternoon. The most economical way of doing both is the “Hike and; Swim” ticket which lasts for 6 days and provides access to the pools in Zell am See, all the cable cars that are operating in both Zell am See and Kaprun as well as the local post buses. For our family of 4 this cost €260 (or £193), which is quite reasonable given that two trips to the Kitzsteinhorn would cost the same amount. One of our favourite ‘cool’ activities is summer sledging on the Kitzsteinhorn glacier at the Ice Arena. So cool in fact that we had to do it twice. The best time to go is as early as possible to avoid the lift queues that build up as the day progresses. On our 2nd visit we went very early and even spotted a wild alpine marmot grazing on the lower slopes during the first cable car ride, anyway we were first to arrive and the piste bashers were still preparing the piste with fresh snow but once they’d finished we made ‘fresh tracks’! There’s something for everyone up there, even if it’s just relaxing in the café/restaurant with a coffee and apfelstrudel. 1. Schmidolin’s Baptism of Fire – a great walk for all with activity stations for children at 12 different points en route. It seems that on each of our visits there has been one or more new stations to try out which maintains their interest. Our preference is to start at from the Areitbahn lift, although it’s possible to do it from the City Express (Mittelstation) too. 2. Route 68 - the High Promenade is a lovely walk down from the Schmitten summit to the Sonnkogel chairlift where there is lots to see and do on the way, finished off with a drink and a bite to eat at the restaurant before taking the chairlift to the Sonnenalm cable car. 3. Route 55 – the Plettsaukopf is a great short walk from the City Express (Mittelstation) through the trees to the reservoir where there is a play park and a water feature. The apfelstrudel at the Mittelstation restaurant was wonderful too and the children enjoyed the trampoline! 4. Route 50 – this is much longer and downhill all the way (but not as easy as you might think) from the Schmitten summit past the Breiteckalm and on to Mittelstation. We imagined we were skiing in the winter whilst walking down the grassy pistes. After arriving back in Zell on the City Express we took the free bus back to the Schmitten car park to fetch our car. 1. Derek & Sue had always said how nice the bathing lake was at Niedernsill and so this time we made a point of visiting it, in fact twice, and the entry cost for us all was approx. €18. They are absolutely right, and it’s crazy how it has taken us until now! It’s a beautiful small lake in a picturesque location with climbing frames and hammocks above the water, a water slide and pontoon plus a giant water fountain. The water temperature was just perfect and even when busy it’s not overcrowded. There’s a café and ice cream stall, just everything you could need for a full afternoon lazing about on or in the water or its grassy banks. If you don’t want to take it easy, there are tennis courts next door and a sandy volleyball court too. 2. We also returned to the pool at Piesendorf which is a little cheaper at €11 for us all. This too has stunning views and is separated by multiple pools, longer water slide, Jacuzzi and sports pool. It too has a café The water was a little cooler but given the heat that was fine too. It too has a café and changing rooms and can be accessed by the lokalbahn train that runs between Zell am See and Krimml. Most evenings we were too tired to do much exploring and so relaxed in the apartment but on the Monday night we did also enjoy the ‘Mystical night of water’ in the Sigmund Thun Klamm gorge walk which is just a minute up the road. We’ve walked through the gorge a number of times before because it is so nice but had never done so at night. The guides spoke in German and English and after walking through the gorge in twilight and by the lake we arrived at a welcoming campfire where we listened to stories and ate a baked potato. On our return we were each handed a firelit torch to make our way back. It was very popular and well worth the money (<€20 for the family). On our last full day we decided to treat ourselves to a full day pass at the Tauern Spa in Kaprun, which cost €65. It’s a five star complex with many different pools indoor and out as well as a long water slide, outdoor café with waters edge ordering and an excellent restaurant. This place never disappoints! With a non-alcoholic cocktail in hand, on a sun lounger by the salt pool, with a great view of the Kitzsteinhorn and music playing in my ears whilst the children are having fun, what could be better! The day we left for home we said goodbye to Kaprun with another go on the Maisiflitzer alpine coaster, an exhilarating experience whizzing down the mountain side in a cart on a rollercoaster track. Our family ticket for one ride was €26. We were also unlucky to just miss the annual village festival which was setting up for the evening, and by all accounts they even managed to set a new world record for the longest ever apple strudel at a staggering 752m! Once again thanks to Derek & Sue for the use of their apartment in Kaprun. It’s the perfect base for everyone young and old to explore this wonderful area. Nice Blog, I like It, Find Amazing Kerala Tour Packages. Thank you so much for sharing the news. I really want to go along with family on this vacation. Wow such a nice blog very beautiful destinations in Australia. I was also finding destination for next summer. Thank you for sharing such an nice blog with us. It is a perfect place to spend the holidays and enjoy the history behind in addition to its beautiful landscapes.